Humble Bundle isn’t making any effort to respect your time, although it is very friendly on the wallet. The latest Humble Bundle is chock-full of sims, which is of course a recipe for suddenly realising it’s 2:00am and you’ve spend the last eight hours clicking around menus making virtual money. 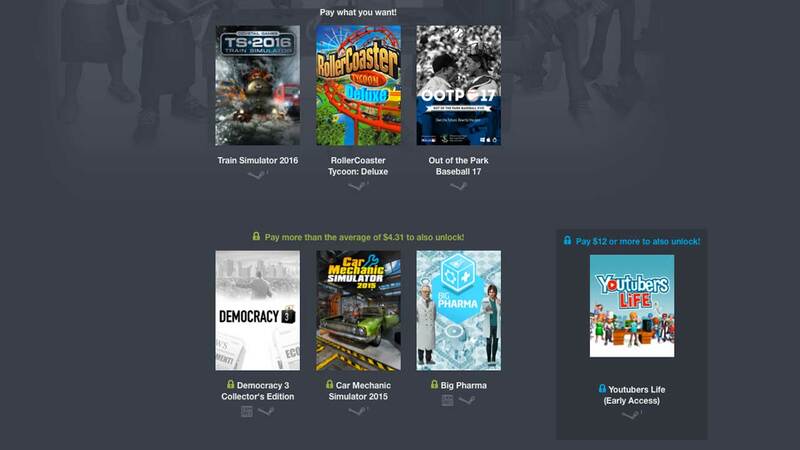 Pay what you want over $1 Train Simulator 2016, RollerCoaster Tycoon: Deluxe and Out of the Park Baseball 17. Beat the average ($4.31 at time of writing) to also receive Democracy 3 Collector’s Edition, Car Mechanic Simulator 2015 and Big Pharma. If you fork out $12 for the premium tier, you’ll get Youtubers Life – an Early Access title. Many of this week’s games are available on Linux and Mac, and a couple come in DRM-free form. As ever, you decide how your payment is split between developers, organisers and charity. This week’s beneficiaries are Direct Relief, Charity Water and an optional third cause of your choosing. Well? Go take advantage. Don’t say I didn’t warn you about the 2:00am thing.